You might have some silver jewelry which has lost its shine. Don’t worry, there’s an easy solution. Rub them with a small amount of toothpaste. They will gleam like new. With the help of toothpaste, you can make your car headlights look slick and clean. It may sound doubtful. But those who have tried it say, this way is not worse than using an expensive kit part of the store. Rub the headlights thoroughly, rinse them and you will see the difference. Taps lose their initial shine very quickly. Don’t hurry to buy undoubtedly expensive cleaning product. Just cover them with a thin layer of any toothpaste and rub with a cloth. You will be surprised with the results. In fact, it works well on any chrome-plated surface. Did you set the wrong settings and your iron suffers from a dirty bottom? Or perhaps it’s covered with some grime. 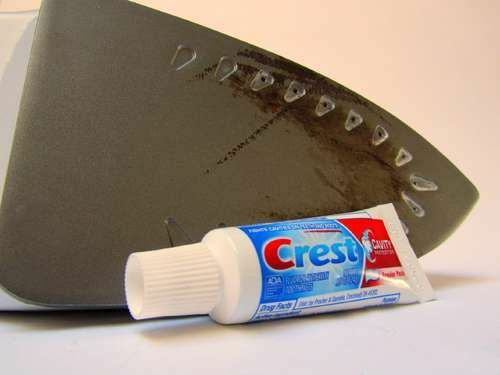 Put some toothpaste on the surface of the soleplate and rub it around and might be off using a damp cloth. Have you cleaned fish, cut garlic and now your fingers smell funny? It’s a typical story. Certain odors such as onion, fish or garlic are tough to remove from your hands. But if you wash them with a small amount of toothpaste, the smell will disappear in no time. This is how the petrol pump mafia cheats you with a chip !